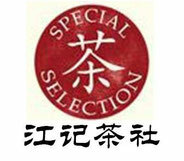 In the family of teawares, porcelain has the large number of variations. 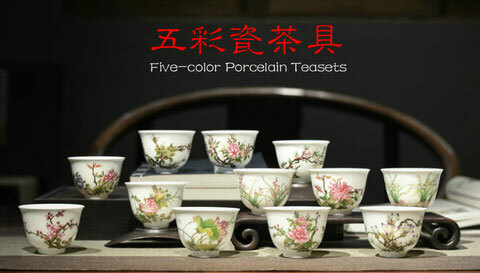 This is because of the natural link between porcelain and tea. 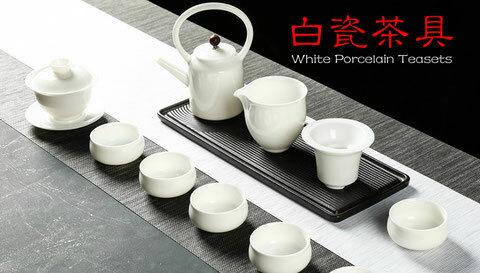 Porcelain is a big invention of ancient Chinese people. Ceramic utensils were in use early in the first stage of Neolithic Period, about 8000 years from now. with the development if civilization, the art of ‘earth and fire’ continuously flourished and brought out new ideas. 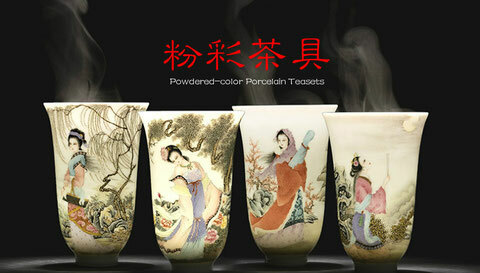 In the Shang Dynasty about 3000 years ago, original porcelain emerged. 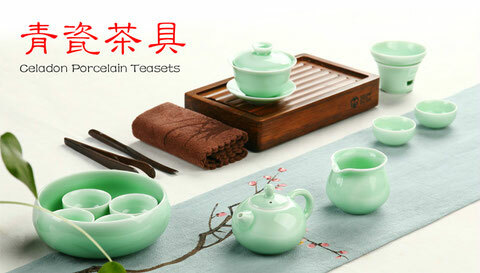 Then after thousands years of creation and accumulation, in the Eastern Han Dynasty, craftsmen first made mature celadon in Shangyu, Zhejiang Province. 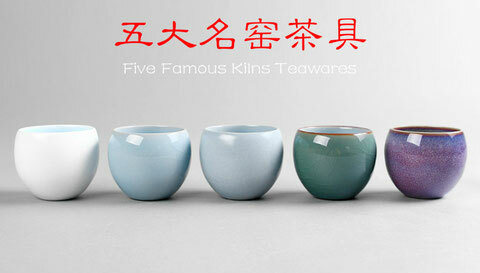 The model of this celadon used china clay and china stone and was fired in high temperature of 1000℃-1300℃. Thus the body was hard, tight and water-resistant. There was a layer of green and grey glaze outside, which was smooth and bright. In the last stage of the Eastern Han Dynasty, porcelain became a daily utensil for common people, heat-resistant, mass produced, affordable and easy to clean. 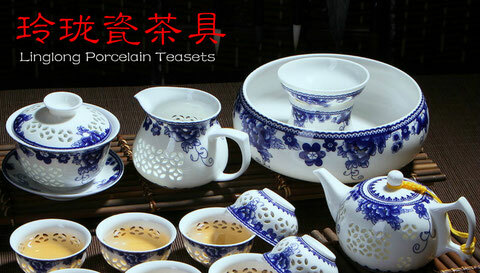 In addition, both tea and porcelain shared a characteristic of cleanness. 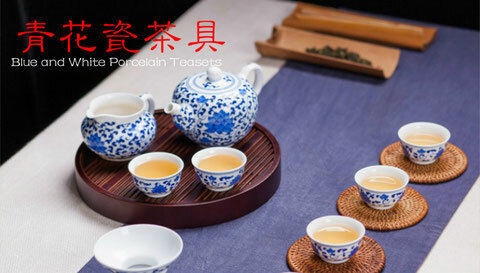 Therefore, porcelain was naturally linked to tea when it first appeared. 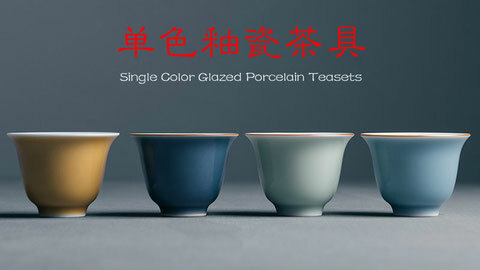 Chinese porcelain teawares can be divided into single-color-glazed and multicolor glazed ones. 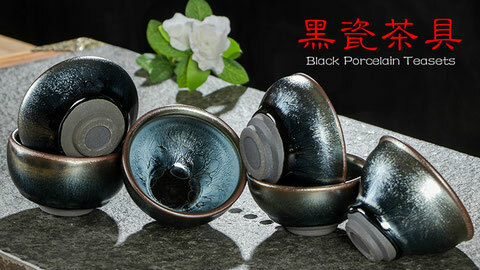 Beside celadon, white and black glaze, which are the most common single colors, there are also other types like green and white,red, yellow, blue and green glazes. 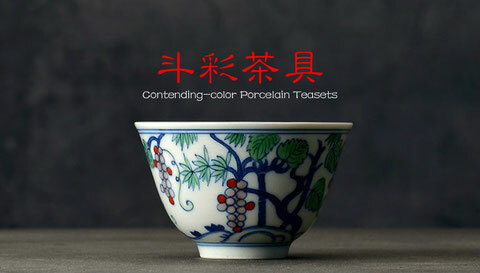 Faience porcelain, also called “colored painted porcelain”, refers to the porcelains which colored paintings, including underglazed faience porcelain and overglazed porcelain. Underglazed faience porcelains mean the colored pattern shown under the transparent glaze. Thus, the colored pattern will not expose to the outside and it will neither be worn, corroded nor corrupted. 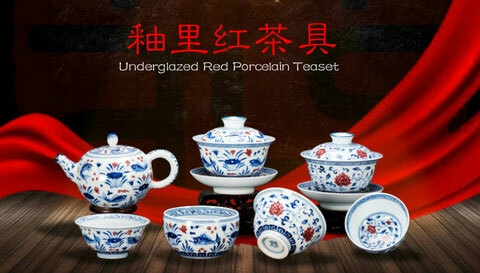 Among underglazed faience porcelains, the most famous kinds are blue and white porcelains, underglazed red porcelain, blue and white underglazed red porcelains, which became mature in the Yuan Dynasty, as well as three-colored underglazed porcelains and colorful underglazed porcelains in the Qing Dynasty. The colored pattern of overglazed faience porcelains show on the glaze. The decoration patterns vary from simple to complicated while there are bright single or multiple colors, which is more suitable for decoration. Overglazed porcelains include clashing color glazes, five-color overglaze, rose-glaze and enamel glazes.